Several people have claimed that Department for Work and Pensions (DWP) assessors have asked people ‘why haven’t they killed themselves yet?’ The claims suggest this has generally been asked of people who have issues with or a history of mental illness. It should be pointed out that these assessors work for Atos, which is a private company paid by the DWP. It should also be made clear that these assessors are not in any way mental health professionals who are trained to deal with such complex questions. During my #pip assessment I was asked why I hadn't killed myself yet. This is standard, assessors regularly ask this question. Cuts are costing disabled people their lives, but the assessments themselves can also put us at risk. They are designed to be intrusive and manipulative, and I wanted to raise awareness of that. When applicants are asked questions like this, we are forced to explain our reasons to stay alive. No one should be expected to do that, especially in such a toxic and unsupportive environment. Assessors do not have the time or skills to explore the answers to this question with us, and they are not able to provide the support which may be needed afterwards. This question was also completely irrelevant to my assessment, it had no impact on the outcome of my award and it wasn’t even referenced in the report. And so we must question the motives behind it. These assessments are not safe, people are terrified of going through them, and many are traumatised afterwards. Government need to investigate the assessment process as a matter of urgency, and it needs to explain why questions like this are being asked. We are unaware of a complaint but we will investigate if one is made. Our role is to provide a well evidenced report based upon information obtained using the criteria laid out by Government. The professional and compassionate service we provide to claimants is our primary consideration. 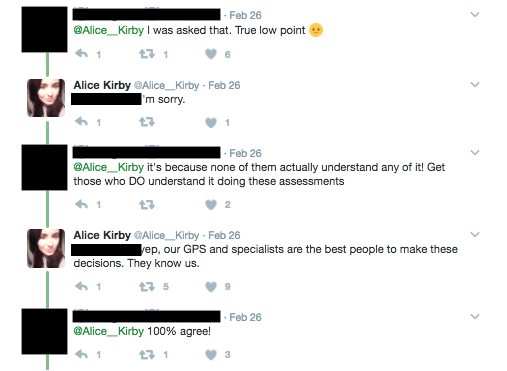 This is not the first time that people have complained about DWP assessors asking them why they haven’t committed suicide yet. And if these allegations are true, it’s hard to understand what purpose asking this question would serve. It’s one thing for a trained psychologist to ask such a question. It’s quite another for someone who doesn’t have the training to deal with what could be a very complicated response. If this is how they are treating some of Britain’s most vulnerable citizens, then we may have more reasons to worry about the DWP than we realised. I wonder what the assessor would do id the reply was “So I could come here today and fecking kill you first as they get up!” Probably run out the door terrified and forgetting to log off as they went. I agree with everything said in the piece. It is wholly unacceptable. I feel so terribly sorry for those who have been asked these sorts of questions. When I am reassessed (my transfer from DLA to PIP. My transfer from IB to ESA was done purely by paper, not face to face), I will secretly voice record the interview, and hopefully will be ready for a question like those detailed. I have nothing to lose, my reply would be to refuse to answer it. If the assessor threatened to void the assessment, because I refused to answer, I would tell the assessor about the voice recording and that I would send the recording to all press – and social media – directly the assessor leaves my home. There is one section in the piece above that I disagree with. The part where the author states that a psychologist might (be ok to) ask a patient, why haven’t they committed suicide yet, or why did it fail. A good psychologist (in fact any and all good clinicians) would never, ever, ask such a direct question.